Today is Feature Day over at Your Next Stamp and it's all about Tags! I love making tags, so this was right up my alley. I decided to make a tag using some of the fun holiday dies that YNS offers in the shop. For my tag, I used the Stitched Square Frame die set for my main tag shape and size. For the finishing touch, I added some glitter and Stickles to the icicles and some sparkle to the star using my Wink of Stella pen. The string was added to the tag using some red Divine Twine. Be sure to stop over at the YNS Blog to see all the fun creations made by the DT. And don't forget to leave a little love there so you can be entered to win a stamp set of your choice! Thanks for stopping by and hope you have a great Tuesday! It's time for some Winter fun inspiration from the YNS DT for this month's DT Dare! The theme is Winter Fun and there are plenty of whimsical sets released this month to show off those fun inspirations. For my card, I used the newly released set of Sports Fanatic Skating Fun set along with its coordinating dies. I created the Winter scene using the newly released Little Village set along with last months release of Evergreen Trees die and Winter Scene die. Some yellow card stock was added to the back of the homes to mimic a "glow" on the inside. The ice skate was colored with Copics and glitter added to the main part of the shoe. Is it called a shoe? Or maybe the boot? Well, hopefully no one is upset with my lack of knowledge in this area of skating. :) The coordinating dies for the stamp was used to cut out the skate to pop up and the figure 8 marking. The sentiment was stamped directly onto the main panel and the card was finished by adding some Stickles for a little sparkle. Be sure to stop by the YNS Blog to see all the fun wintery creations and leave a little love. Thanks for stopping by and hope you have a great day! It's that time again! Time for another fabulous release with Your Next Stamp! There are so many fun sets and dies that will help round up your holiday creations and make some super cute projects. 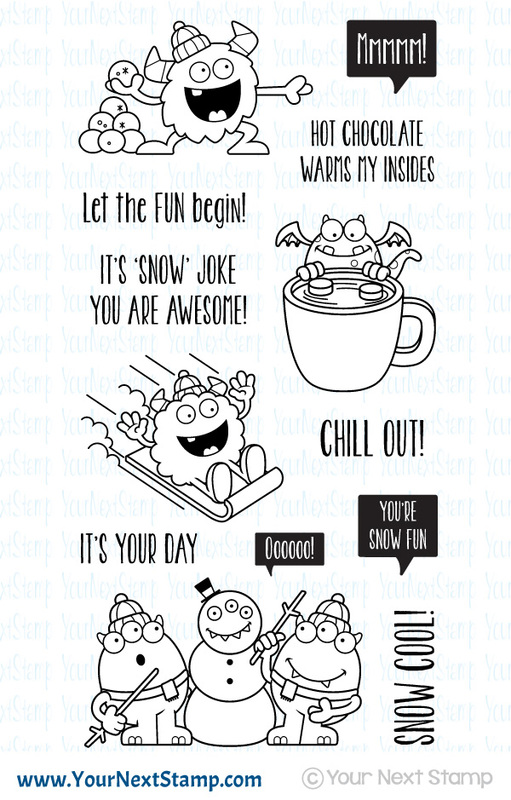 I couldn't get enough of Silly Monsters Snow Fun that I had to include another with my tags I made using the Holiday Postage set. 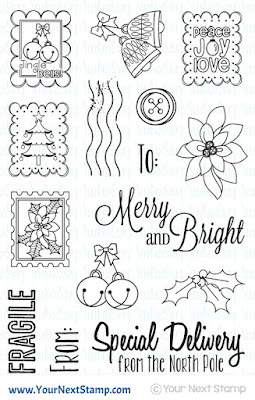 With the Holiday Postage set, there are so many ways you can create something fun and unique. For me, I really wanted to create some tags with it. Using the Cool Tag three set, I cut out the tag using some patterned paper from EP and then layered it with the images. 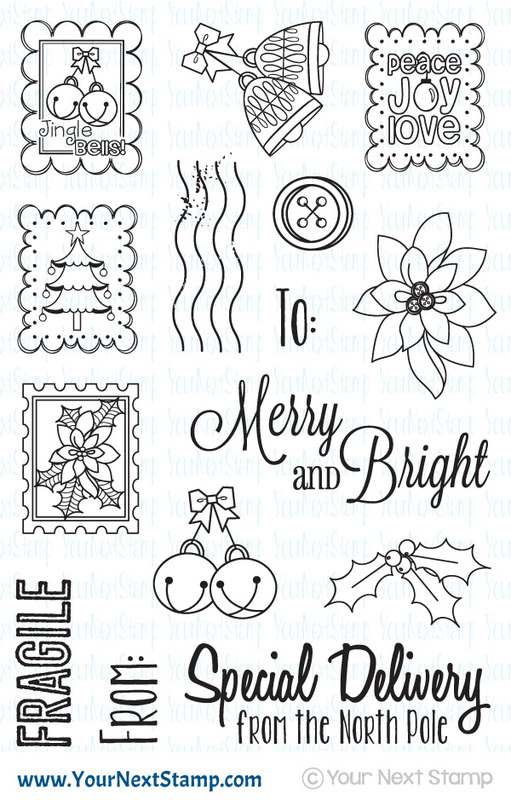 This set makes for a great way to decorate your holiday envelopes as well! 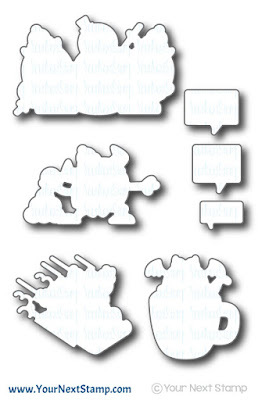 The Silly Monsters really speak for itself with the hot chocolate fun he seems to be having. It is the perfect drink for the season while it is chilly. This image was colored with Copics and cut out using the coordinating die set, while the mug was paper pieced. Now you know Karen is always super generous with her release sales. This release she is giving 20% OFF your entire order! Perfect for getting everything on your list. 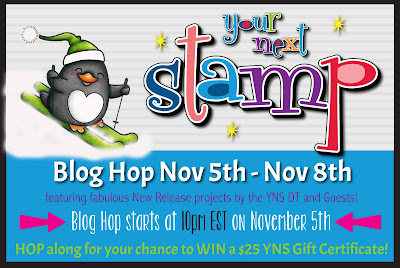 Be sure to continue the hop and leave a comment along the way for your chance to win a $25 gift certificate to YNS! Thanks for hopping by! It's that wonderful time of the month! Time for another Your Next Stamp release and you will want to get your list ready. 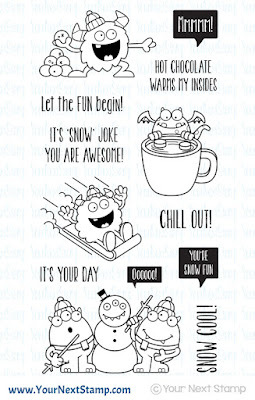 For my card, I am using the ever cute and fun set of Silly Monsters Snow Fun. I couldn't resist using the large spinner/slider die set to create this fun scene of sledding down the hill. The image was colored with Copics and cut out using the coordinating die set. I set aside the image and worked on the background by using some paper from MME for the sky and with some white cardstock, I cut out the scene using the Houses on a hill die. The other hills were hand cut before cutting out the slider portion on the top panel. 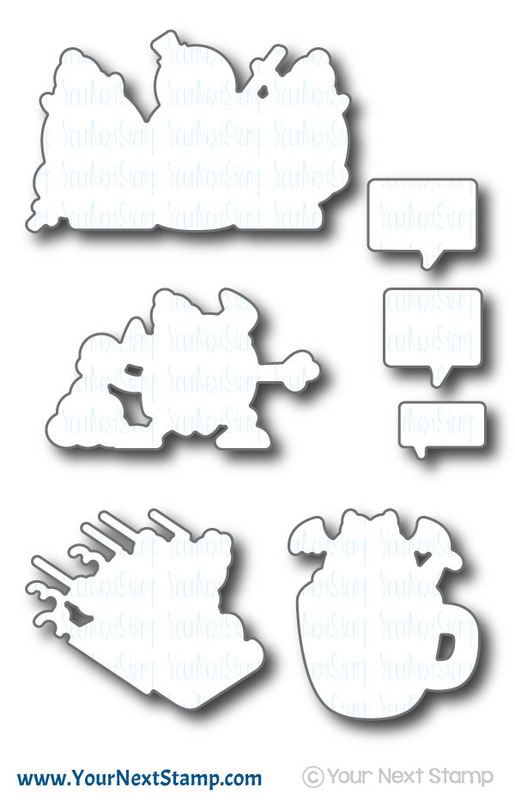 I added the image to my slider disc and the sentiment is glued to the back so it travels with the silly monster. The card was completed by adding some crystal Stickles to the houses and dotted throughout the back panel. 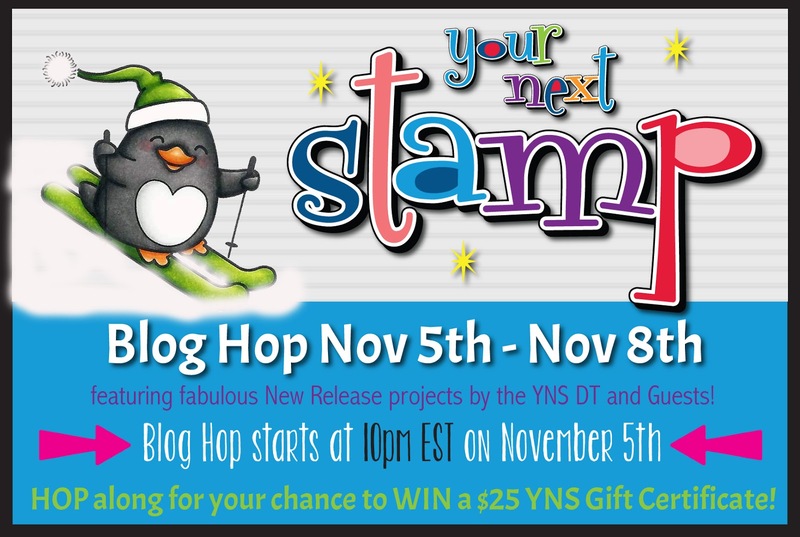 Be sure to stop by the YNS Blog to see the other creations by the DT and don't forget to leave a little love! Thanks for stopping by and have a great weekend!